No idea where this came from but it's very, very true! After last year's fabulous birthday trip to the dentist, I was slightly apprehensive about another visit. I brushed my teeth vigilantly and made sure that very few nights passed without flossing. I was so sure that my "cavity" hadn't progressed, I couldn't even remember which side it was supposed to be on. I did notice that I had a weird little black dot on one of my front teeth that wouldn't go away. I flossed it to death, brushed, tried to get it off with my fingernail. Nothing. K-ster couldn't see it. I didn't dare show my new found flaw to anyone else lest my future modeling contracts disappear. I imagined it must be another cavity coming through on the front of my tooth. Which, of course, is like a death sentence to me. In case you are too lazy to click on my birthday trip to the dentist link, the short version is that I love my teeth. I have been complimented countless times on my teeth. They have always been pretty healthy looking and I've never had a real cavity (I've been told twice that I had a "little" cavity starting and to be sure to keep brushing and flossing and then they mysteriously go away). I had braces, so they are pretty straight, and they aren't too bad colorwise since I won't bleach them. My teeth are one of the few things I will not say "pshaw" about if you tell me they are nice. But don't do it here, in the comments. I'm not fishing. See? Not the clearest picture, but they are pretty decent. I always wanted to do toothpaste ads. When I was little, those super large two front teeth were SUPER LARGE but I guess I grew into them. I used to want to be a dentist or hygienist, I love teeth so much. BEcause I thought everyone had decent teeth like my sisters and I do. Then my mother brought me up to speed on that with one comment "do you really want to stick your hands in some old person's mouth whose breath smells and their teeth are rotten???" No, I want to stick my hands into the mouths of beautiful people whose breath smells like lavender and whose teeth look like beautiful dominoes all in a row. No dental school for me! So, when I went this week to get a regular cleaning, I pointed out my black spot to the hygienist. It took a lot of looking and she just about had to climb into my lap to see it, but she finally found the miniscule speck and promptly scraped it off. It was a stain, she said. Happens all the time. If it happens again, she told me to just drop in and she'll scrape it right off so I don't have to worry. Are you picturing me running into the office, car still running, while I stand in the middle of the waiting room and she scrapes my tooth? Because that's all I can picture! We talked about what the stain might be. Coffee? Tea? Well, yes, I said, I drink tea. See, for YEARS, I wouldn't drink tea because I didn't want it to stain my teeth. All I could picture was my British nanny with those nasty yellow, tea stained teeth. Right, I didn't have a British nanny, but I always feared yellow teeth. But when I mentioned it to my now retired dentist, he said that I would have to drink a crazy amount of tea to have stains and it would take years. A cup a day wouldn't do much. Have at it, was his recommendation. And when I said this, the hygienist wet her pants right on the spot. She said he must have been kidding. If you knew Dr. A, he wasn't a kidder. I doubt he is now that he's retired, either. Of course tea will stain your teeth, she said. He must have been doing an April Fool's joke. Was he doing it just so I'd come back for bleaching? Surely he wasn't that kind of dentist. The new guy hasn't suggested it, so I don't think they were in cahoots. And my teeth aren't all stained yellow. I have no intentions of bleaching because I think it weakens the teeth. But to be told that the little dot, the one that looks like I might have tapped my tooth with a pencil that won't rub off, is likely from my one cup of tea per day? UGH. 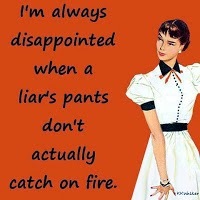 I smell pants burning every time I think about it! I've always had straight teeth, but never as white as I wanted due to poor enamel. Who can you trust if you can't trust your dentist? After that, I would just give up and drink as much tea as I can. stopping by from meet & greet; following you on GFC!